Though Jon seems to have moved from one massive success to another in the making, the road to the top hasn’t always been easy. I recently sat down for an interview with Jon and got some insights into his journey from a VP of marketing at a startup to building a category-leading marketing company. Here are five struggles Jon had to overcome to be where he is today. 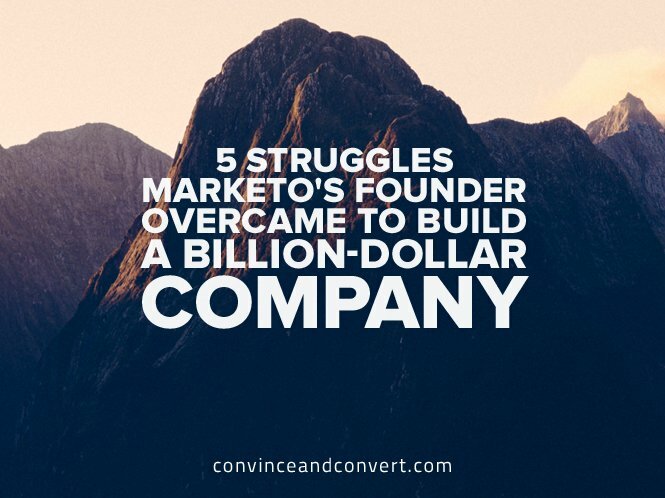 Numbers like $60 million in quarterly revenue make it seem like Marketo was a surefire success. But Jon tells a different story. He was in a low spot before starting Marketo. They met with countless investors to no avail. The struggle continued for some time. Just as Jon was at the forefront of marketing automation with Marketo, he finds himself once again at the frontier of another industry with Engagio: SaaS (Software as a Service) for account-based everything. Creating a new business category isn’t the easiest play, but it’s one that Jon has run before. Jon isn’t just being modest—he has a fairly atypical background for a serial tech entrepreneur. Back in 1994, he was about to enroll at MIT for a physics Ph.D. before the business world called out to him. Jon’s current biggest challenge? Getting teams to think about account-based everything rather than traditional lead-based marketing. In other words, Jon’s teaching business owners, marketers, and salespeople to use nets rather than spears to win new business. This means rethinking the old “land and expand” model for B2B expansion, and coming up with a more holistic way to target an entire account in tandem. But that’s not the only challenge. Jon also needs to convince marketing and sales to play nice together. What’s a New Entrepreneur to Do? After weathering the storm and rising to the status of serial entrepreneur, what insights would Miller look back and give his 21 year-old self?